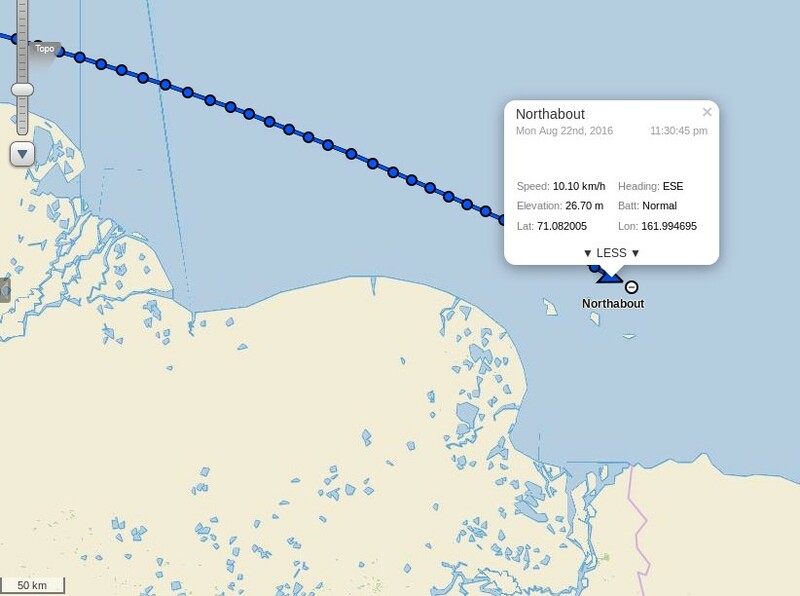 Let’s wait and see when Northabout manages to pass that milestone, before heading to their next scheduled port of call at Barrow in Alaska. 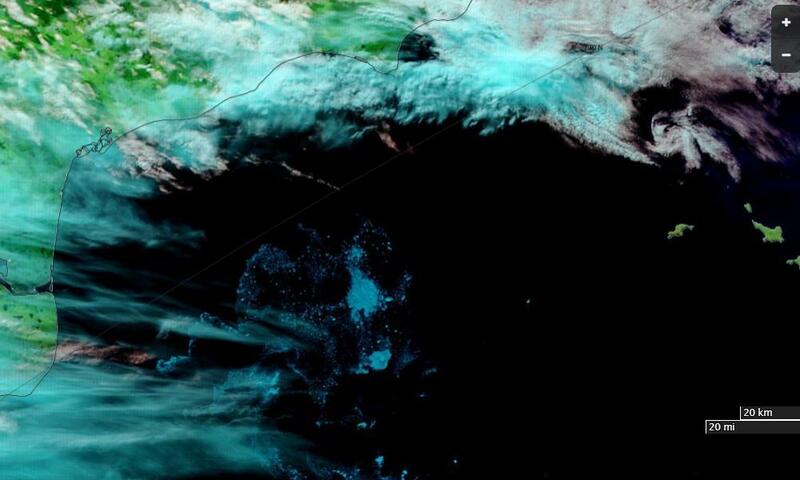 Well slowly making progress, and now into a new sea, East Siberian, Looks the same to be honest. Saw a ship,on the AIS , but couldn’t see it with the fog. Went between the Islands. We had a large patch of 8/10ths ice in the middle, but managed to keep north of it. Along the coast you could again see the remnants of an old Polar station. What a vast coast to look after. Just as things were getting into a rhythm, the engine is over revving. We are so close but so far out here. My stomach is sometimes in my mouth, Comrades trying to work it out. If not, is a slow sail from here to Alaska. We’ve got enough wind to put the staysail out and the skies are clear. I think quite a lot of how I was feeling may have been that I hadn’t got any sunshine for over two weeks, the last couple of days however have been warm(ish) and bright. I at least am coming dangerously close to feeling actually happy, I don’t know about anyone else… Provided we continue like this we should be in Point Barrow in under a week. A long slog of a day. Very choppy seas which makes living onboard difficult, especially sleeping, when you can be fast asleep and suddenly wake up in mid air. The wind we had was a head wind, so slow going. Getting to the edge of the World is proving tiresome. Our track to get the best wind is towards the ice, and north east, hoping this will change during the night, and bring us back south to our waypoint. A new day tomorrow, and hopefully better winds. A long slog in the Chukchi Sea. Its renown for its wild weather and seas. 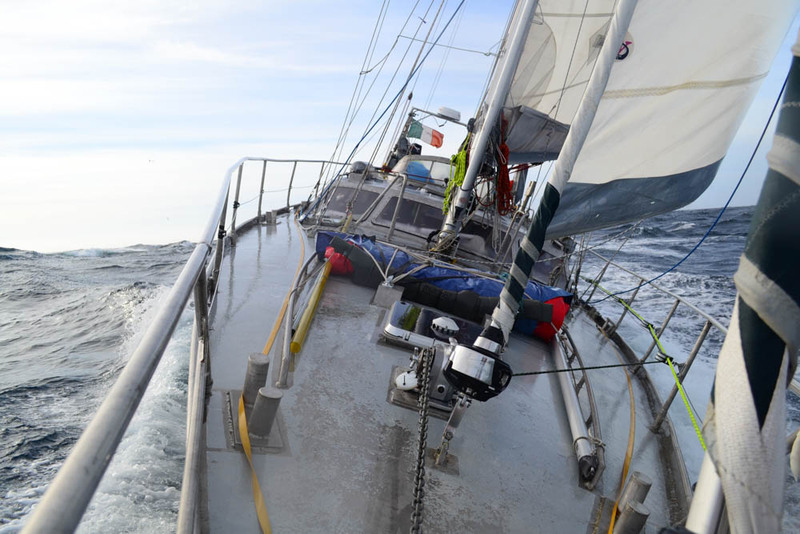 With rising winds now in the 25/30 knots, we have had a bumpy ride, but fast and in the right direction. 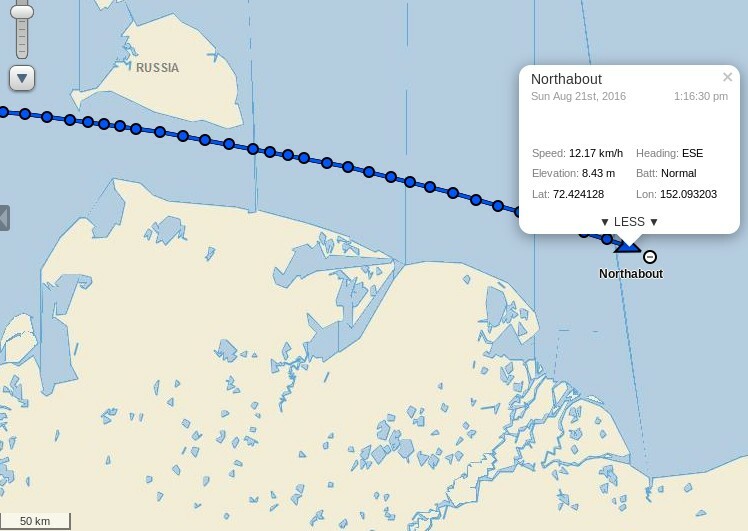 Well, well, we passed the date line and the W 168 58 .620 at 16.57 boat time, that is the point we can inform the Russian Authorities that we have finished their Northern Sea Route, and we no longer have to report to them daily. I will celebrate this milestone when we get to Point Barrow. It’s only just sinking in what we have all done. 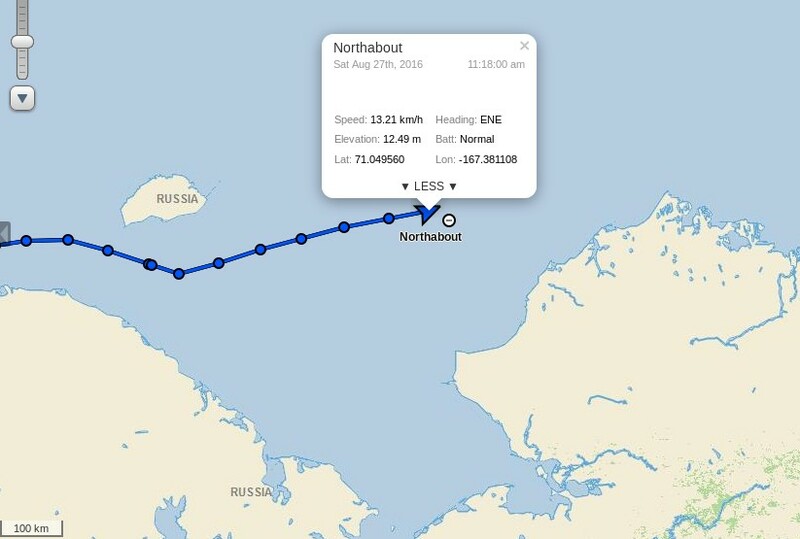 Next stop Barrow, and after that Northabout takes on one of the Southern routes through the NorthWest Passage. It looks like she’ll have much more difficulty spotting some sea ice than on the first half of her polar circumnavigation! Next comes the Northwest Passage, after a couple of days of rest and recuperation! OT PS “Who are you quoting?” was a pun. 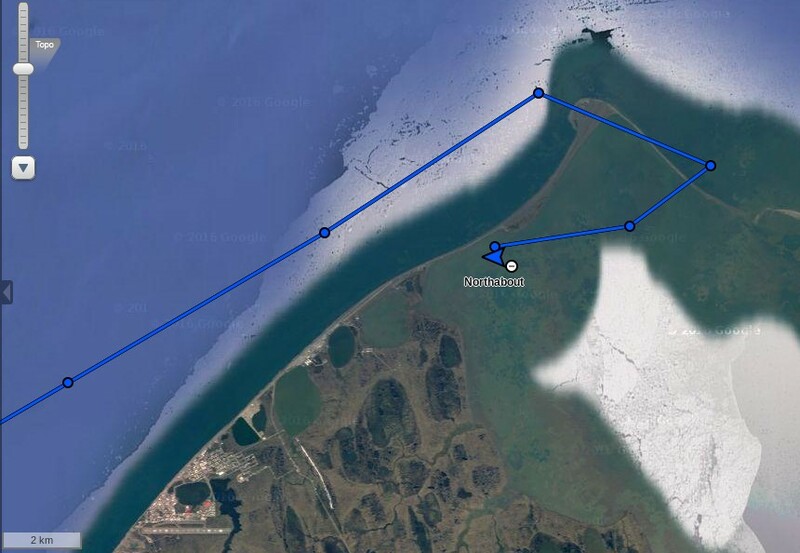 Meanwhile Northabout has now passed Ostrov Bol’shoy Lyakhovskiy and is at longitude 144 east. 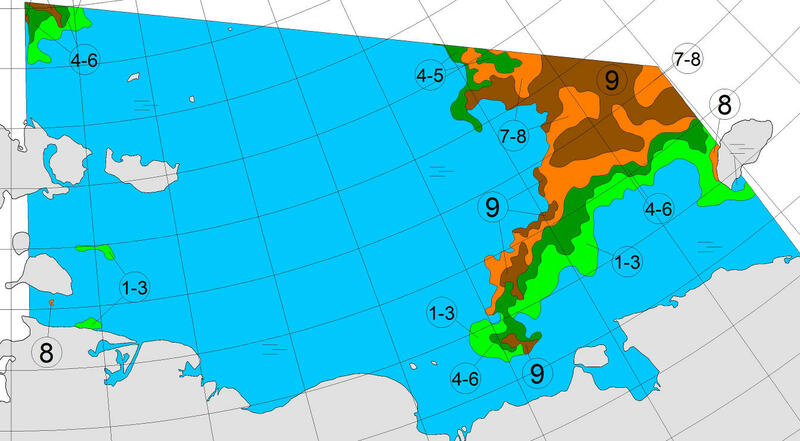 The date line takes a bit of a detour through the Bering Strait, so the exact longitude at which they become 24 hours younger depends on their latitude at the time! Shall we stick with 180 degrees for the moment though? Re: The squiggly date line. I put a comment to that effect on the Polar Challenge website yesterday, but it still hasn’t appeared – awaiting moderation I expect. 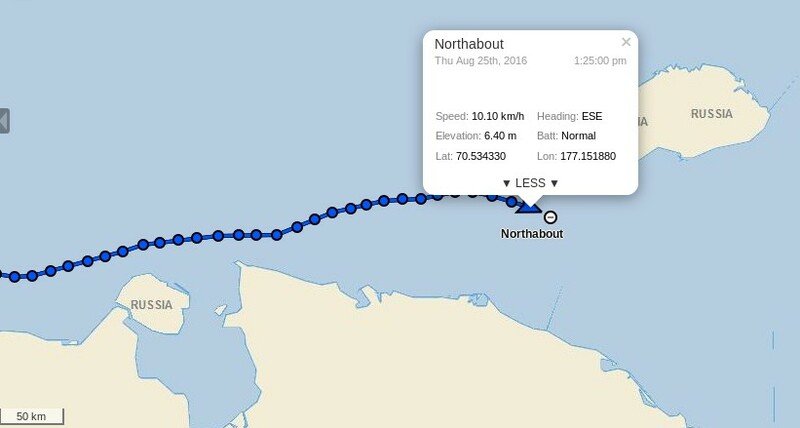 Since Northabout finally started travelling in a straight line, she has clocked just under 15 degrees of longitude in 43 hours. 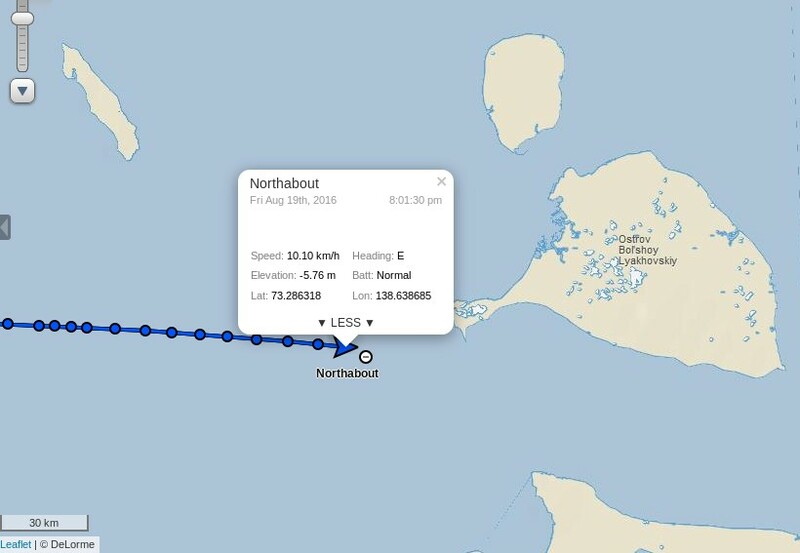 If that rate of about one degree every three hours is maintained, she should reach Point Barrow in about 7 or 8 days – perhaps just a tad behind their schedule for the completion of leg 2. Ousland had connection issues when in this region so there may be a communication delay until they enter the ‘Inmarsat coverage zone’? As far as I can tell that affected the updating of their Spot live tracking map, but their blog articles seem to tie date/time/position together accurately. They suggest that Northern Passage crossed 180 degrees on September 1st and 170 west on September 3rd. Northabout seems to be using DeLorme inReach via Iridium, so hopefully live tracking will continue to work without interruption. Previously mentioned comment has just appeared (along with a few others) on the POC website. 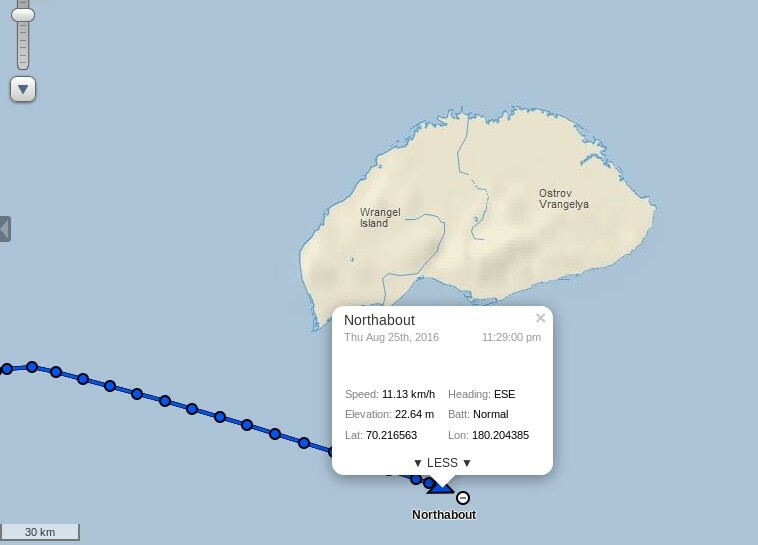 Current position indicates that Northabout is about 5 days ahead of Ousland in 2010, who reached this location on 26/08. Subsequently put into Pevek to refuel on the 29th which delayed them for a day. They’re maintaining their lead, about a week ahead of Ousland at present. Despite having already mentioned the date line, I forgot to incorporate it into that quick calculation. At the current velocity (note the use of the vector rather than the scalar term) Northabout should arrive at PB on the scheduled date. It seem like the crew of Northabout are having to steer south of a tongue of 7-8 and 9 ice. On the most recent (? 19 Aug) Russian ice map, this protrudes from a bit north of Wrangle and heads off in the direction of the mouth of the Kolyma river. It makes it a bit difficult to follow a great circle course. 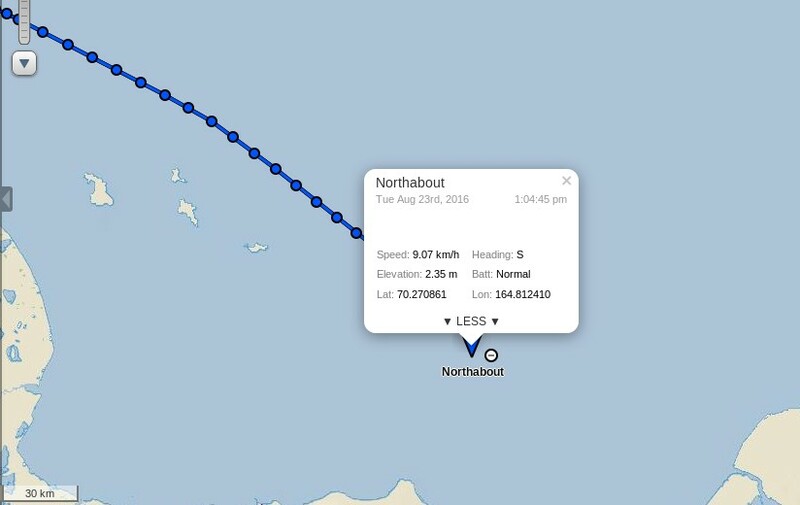 Is anyone else having problems with Northabout’s tracking? After weeks of problem-free tracking, as of yesterday evening, I’m now getting effectively an empty screen below the Garmin banner. I thought it could be something weird with Windows 10 so did a restart, but I’ve just had exactly the same problem on an I-pad. I’ve contacted Northabout’s ground crew, but they are seeing no problem. As the PC and I-pad are using the same router, I’ll try restarting that. That didn’t help – I’m currently out of ideas. No such problem for me today Bill. See the August 25th update above. I’m using FireFox on Linux, so I’d suggest trying that! However that’s probably non trivial for you so I just tried Chrome on Windows 7, and that works fine for me too. I’m having the same problem as you are Bill. I’m on an iPad, no idea what that’s all about! I don’t have any other computers so will have to lump it I suppose! I’ve never tried this before, so I can’t say if anything’s changed, but I’ve discovered that I have the same problem on my Android tablet. Minor typo above – my desktop is running Windows 7 not Windows 10. I’ve dropped another email to the POC ground crew to say that various other people are also experiencing difficulty. It doesn’t work for me on Android, but it’s OK on Linux & Windows 7. The ChristinaHartmann link works using Windows 7 + IE 11, but still gives me the blank screen using Windows 7 + Chrome. In the interim, I’ve had an email back from Frances Gard (POC ground crew) saying that she was going to contact their Tech Support. Even curiouser and even curiouser still…..
Janice – are you fully functional once more? I’ll email Frances to give her the latest, and eagerly awaiting hearing from her tomorrow. Whatever was wrong does indeed seem to have been fixed. Both tracking maps now work for me, even on Android. What is more Northabout has now passed 179 east! Yeah, next check in should be 180! Earlier today, whilst she was at about 159.5W, Northabout performed a slightly weird looking manoeuvre in order to avoid some ice. Eventually enough brain cells kicked into gear so that I could see what was nagging at my mind. 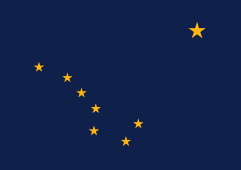 There is a group of seven position markers that have an amazing similarity with Ursa Major (aka the Plough aka the Big Dipper) and the Alaskan State flag. Time for another musical interlude? If the latest tracking is correct they have left Barrow already after less than a day’s R&R.